While the trial of Jason Van Dyke for the murder of Laquan McDonald was taking place, an elderly woman named Bernardine Dohrn entered the courtroom on the fifth floor at 26th and California and sat in the gallery. While there was little fanfare from the media about Dohrn at the trial, it was a compelling moment. To understand why, one must go back to an important period in 1969. In December of that year, activists who had recently formed a group called the Weather Underground gathered in Flint, Michigan. The Weather Underground activists claimed they were fighting American imperialism, systemic racism, and an unjust war in Vietnam. At the 1969 Flint War Council meeting, the group decided to go underground and “declare guerrilla war” on the country, according to FBI documents. Declare war they did. The Weather Underground was responsible for a host of bombings across the country, even accidentally blowing up some of their own members in New York as they prepared bombs for a large-scale attack at a dance to be held on a military base. They traveled to communist countries to learn revolutionary tactics. About three months after the Flint War Council meeting, an explosion ripped through the wall of the Park Police Station in San Francisco, killing Sgt. Brian McDonnell, who was sitting at a desk doing paperwork, and severely injuring three other officers. Investigators determined that the bomb had been designed to explode at a different time when officers would have crowded the room after roll call, but it malfunctioned. From early on, Dohrn was a suspect in the bombing. Many investigators believed she was in San Francisco at the time. 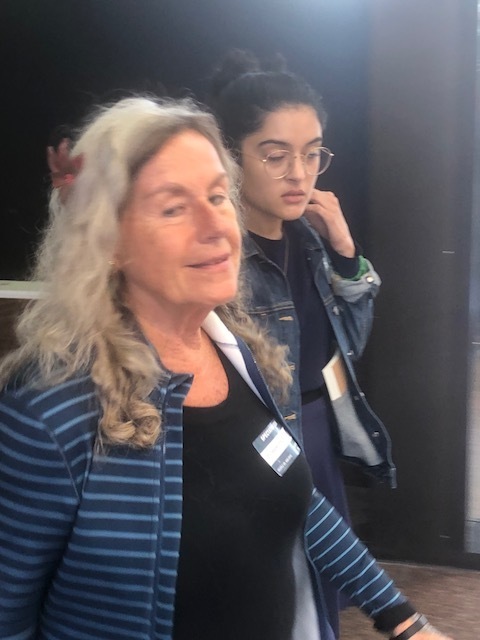 Some witnesses identified a person matching her description in the area, and an infiltrator of the group told authorities that fellow Weather Underground member Bill Ayers, who would later become Dohrn’s husband, said that Dohrn was responsible for the bombing. In 2013, a group of retired federal agents and the San Francisco Police union would ask that the case be reopened and Dohrn be investigated for the murder. How likely was that, though, when the president at the time was Barack Obama, who had begun his own political campaign in the home of Dohrn and Ayers? And so the case remains closed, even though the murder is still unsolved. But the FBI records of the Weather Underground are fascinating, even the lesser-known ones. Consider one FBI report about the 1969 Flint War Council meeting in which Dohrn announced the guerrilla war strategy. The FBI ran the license plates numbers of the cars in attendance. One of them came back to a Chicago attorney named Jeffrey Haas. Haas is a founding member of the law firm the People’s Law Office (PLO), a law firm that has spearheaded the attacks on Chicago Police officers, claiming they have violated people’s constitutional rights, and also represented organizations advocating violent revolution, like the Weather Underground, the FALN, the Black Panthers, and the NATO Three. The connections between Haas’s PLO and the Weather Underground would surface again and again. For example, the infiltrator of the Weather Underground described how attorneys at the PLO acted as a communication outlet among Weather Underground cells in different cities. Children of members of the law firm were reportedly used by Dohrn to scout bombing locations, according to a book called Days of Rage by Bryan Burrough. 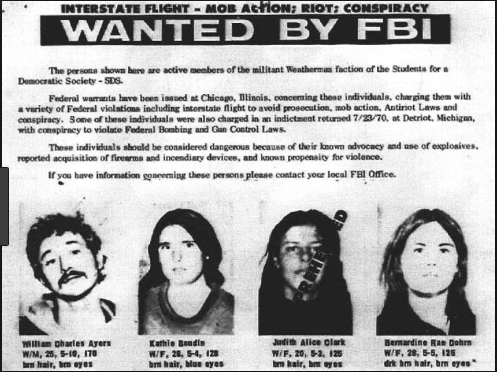 Dohrn ended up at Northwestern University’s Law School, a law school that would work hand in hand with the PLO to attack police officers and prosecutors, claiming these members of the criminal justice system were such evil people that they would regularly coerce confessions for the most heinous crimes from innocent people. They freed dozens of supposed wrongfully convicted killers and garnered millions in settlements from the city. Even when evidence emerged that their claims were completely bogus, that many of these predators should never have been let out of prison, that their release was the result of the most sinister machinations, the power of the PLO and Northwestern was so great in the city that they remained unchallenged by a media largely comatose to the evidence. They had come a long way from wearing football helmets and rioting on the streets of Chicago in 1968 and 1969. With a group of Marxist zealots that combined well-educated white intellectuals with inner-city black radicals, it was all but inevitable that these groups would make inroads into Chicago’s political machine. This is what happened to the Weather Underground and their allies like the PLO. They moved into the law, education, and the media and began working on their narrative to relentlessly attack the criminal justice system, claiming their crusade was a matter of social justice and higher principle. And slowly they transformed themselves from violent revolutionary radicals to icons of social justice fighting to strengthen the republic. What this truly meant was a deep radicalization of the Democratic Party that ran the city, a radicalization that spread throughout the national party as Chicago foisted Barack Obama upon the national party to undermine the candidacy of Hillary Clinton. And true to form, Obama’s administration, particularly his Attorney General’s Office, would wage the same war on the criminal justice system on a federal level that they waged in Chicago. Ask Donald Trump. Or better yet, ask the family members of murder victims who saw the offenders walk out of prison and become millionaires while Obama’s Department of Justice said and did nothing. How powerful was this transformation? Consider that Dohrn, a woman many law enforcement officials believe set off a bomb that killed a police officer and injured many others, a woman who called for a violent communist revolution, walked into the trial of Jason Van Dyke last week as easy as Kiss Me Kate. Not one journalist seemed to take much notice. Not one wrote an article about it. Not one of the dozens of cameras lined up in a phalanx on the first floor to capture an image of Jason Van Dyke walking in and out of the building bothered to record this woman lingering in a supposed hall of justice. The resume of the unrepentant Dohrn reveals an intense hatred and cruelty. At the courthouse, Dohrn mingled with members of the gallery. She chatted with “journalist” Jamie Kalven, the activist who got the Laquan McDonald shooting tape released to begin with. Dohrn sidled up to Andy Grimm from the Sun-Times, chatting amiably. But she garnered little attention. Instead, all eyes were on Jason Van Dyke and much of the media, the contemporary media largely bought and sold by the Dohrnian mythology of the radicalized Democratic machine. In collusion with Dohrn’s worldview, the media engaged in a sophisticated campaign to utterly destroy Van Dyke in the public imagination by imposing their mythology upon his case. The Chicago Tribune united with public radio station WBEZ to broadcast a podcast called 16 Shots. The podcast began just a few weeks before the trial and makes large generalizations about the significance of the trial—an allegory, the narrators claimed, before the evidence was even presented at trial. Who can declare something an allegory, particularly a criminal case, before the evidence is ever revealed? The Tribune can, in large part because they have been doing so for some three decades. The intent of the podcast was clear enough: Poison the jury pool to promote a political agenda, for, like the true disciples of Bernardine Dohrn and the PLO, it is incumbent upon this group of journalists to ensure that no police officer ever get a fair trial in Chicago. And so many compelling questions went unasked from Dohrn as she walked out of the courthouse. Certainly no journalist approached her and asked her if she indeed was involved in Park Station bombing in 1970 that killed Sgt. McDermott. Such questions may have taken shape in another time . . .